Back in 1994, when my family was on Christmas vacation, we managed to catch an airing of one of Green Day’s concerts on MTV (the entirety of which can be found here), where they were shown maniacally darting about the stage, writhing and twitching erratically with each chord change. My mother said, “What’s wrong with these people? They look like they stuck their fingers in the light socket.” This memory brings me to the reason why you will always love watching a Green Day show: their consistent, powerful energy, and to quote Dr. Frank N. Furter from The Rocky Horror Picture Show, “You shall receive it… IN ABUNDANCE.” 19 years after watching that concert on television, they’re still capable of rocking sold-out arenas and making sure every last person in attendance feels it. They poked their heads in last night at the Patriot Center in Fairfax, VA on their 99 Revolutions Tour, after postponing an earlier date due to frontman Billie Joe Armstrong’s short stint in rehab, and their electrifying presence has not diminished one single whit. Supported by surf-rock band Best Coast, Green Day have been touring to promote their new album trilogy, “¡Uno!”, “¡Dos!”, and “¡Tre!”, released over a span of three months last year. These albums feature 37 tight, raw pop/punk songs with their brand of melodic esprit, combining arena rock grandeur with garage rock roughness. Last night, they brought these songs to bear upon the waiting audience, mixing in old favorites, a few live rarities, and some odd, unusual covers that had me scratching my head in amused confusion. In this era of overly safe, family-friendly, twinkly-clean popsters (who all seem to be currently going through growing pains, which makes them even less fun to watch) and acts whose fame doesn’t last due to overexposure (blame the media, traditional or social, for burning us out on stuff like “Gangnam Style” and “Call Me Maybe”), it’s fantastic to see a band like Green Day still investing in the audience and giving them a good time. With Armstrong and bassist Mike Dirnt having been together as Green Day since 1987 (drummer Tré Cool didn’t join the band until 1990), it’s no surprise that the entire band is excellent as both musicians and stage performers. With Armstrong scurrying from stage left to stage right to keep the crowd’s fists in the air, Dirnt and Cool hold down the fort ably, locking together and forming a thick rhythm capable of supporting Armstrong and his antics. Additional guitars and other instruments were handled by fourth member Jason White and regular touring members Jason Freese and Jeff Matika; Freese‘s saxophone noodlings on concert favorite “King for a Day” were a memorable moment of the night. Keeping the energy up and the audience guessing what kind of shenanigans the band will get up to next has always been a fun part of their shows, and last night was no exception. After whipping out rarities like “J.A.R. (Jason Andrew Relva),” “Who Wrote Holden Caulfield?” and “Disappearing Boy,” they pulled out some very unexpected snippets of classic rock tunes, such as “Sweet Home Alabama,” “Sweet Child O’ Mine” (and I shudder to consider that “classic rock”), and “Highway to Hell.” Of course, the audience ate it right up and jammed along with them, screaming the lyrics and applauding the attempt at emulating the high-pitched vocals of W. Axl Rose and former AC/DC singer Bon Scott. But what really shined last night was the energy and the seemingly hyperactive hijinks of the band which accompanied rock-solid renditions of their famed catalog. 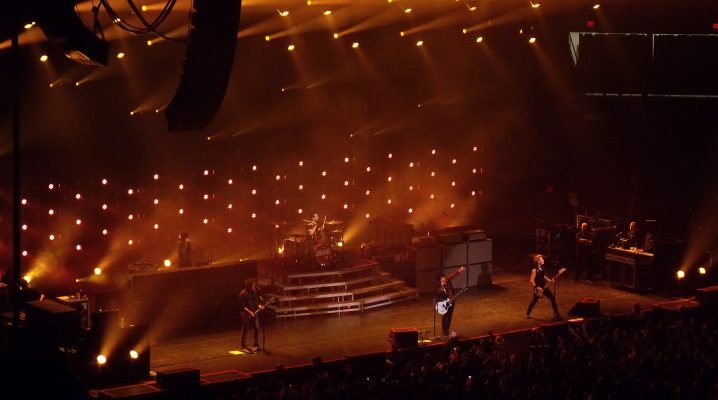 As with previous Green Day tours, they bring their A-game every minute of every show, and even though the crowd roars the lyrics to perennial favorites like “Basket Case” and “American Idiot,” they always go that extra mile to make sure you’re not just singing along, you’re howling and bouncing along with them. 99 Revolutions Tour, American Idiot, Billie Joe Armstrong, Dookie, George Mason University, Green Day, Jason Freese, Jason White, Jeff Matika, Kerplunk, Mike Dirnt, Patriot Center, Tre Cool, ¡Dos!, ¡Tre!, ¡Uno!